Posted August 16, 2017 by Alec Smart & filed under City News. South Sydney residents fear they will face never-ending traffic jams and restricted parking when new high-rise housing developments, currently under construction, are finished. A massive urban regeneration program is underway in the adjoining suburbs of Rosebery, Zetland, Waterloo, and Alexandria, with additional development projects in the planning stage. Once finished, and included with other high-rise ventures in nearby Mascot, Eveleigh and Redfern, they will result in an influx of tens of thousands of new residents to South Sydney in an area that was, until recently, predominantly industrial. 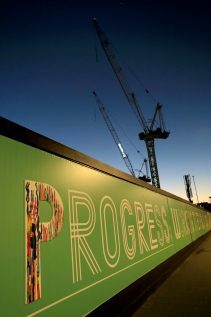 In the North Rosebery Precinct alone, the City of Sydney Council predicts that 6,000 new residents will be accommodated. In December 2015 the NSW Government revealed plans for 10,000 new dwellings to replace the Waterloo Housing Commission tower blocks, the majority earmarked for private tenants. The 278-hectare Green Square precinct is forecast to have its current population tripled to 61,000 people by the year 2030, over 8,000 of them residing in a newly created town centre. This will easily become the most densely populated region in Australia. Urban TaskForce, an industry organization that represents property development interests across Australia, are propelling many of South Sydney’s new high-rise projects. Dominated by urban planners, economists, lawyers, financiers and, of course, property developers, it works closely with the NSW Government to implement new projects, particularly those that benefit the private sector. In June 2017, Randwick Council announced plans to block Urban TaskForce’s plans to push for higher building limits in Kingsford and Kensington. Urban TaskForce is also at loggerheads with the City of Sydney Council, which it called ‘scaremongers’ in a June 2016 press release, after the council objected to Waterloo Tower’s population increase to 700 people per hectare. “The Urban Taskforce calls on the City Council to stop their scaremongering campaign about the redevelopment of the Waterloo estate and to take a constructive role that supports the State Governments urban renewal project…” it declared. “The NSW State Government told the City Council that they’ve got to put in all these units,” said Wayne Moody, spokesperson for Rosebery Residents Action Group. “They keep telling us we have to take our share of units, like everyone else, but where are people going to park? “We never used to get parked out on the weekends in Rosebery like we do now. Many of us have driveways, but if we’re going to the shops or working in the area it is very difficult finding a parking spot. But parking is just the tip of the iceberg. With the imminent arrival of tens of thousands of new residents, many of whom will rely on their cars to commute, driving through familiar neighbourhoods will inevitably involve long delays as merging traffic banks up and stalls. City of Sydney Lord Mayor Clover Moore appreciates that South Sydney’s transport nightmare is fast approaching, with rush-hour public transport services already at peak capacity. “The government is enjoying the stamp duty rewards from apartment construction in this area, now it’s time for them to provide essential services,” she was quoted saying in the SMH in May this year. In order to reduce reliance on cars, City of Sydney Council has urged the NSW State Government to commit to another light rail line from Central Station to the new Green Square precinct to facilitate commuters travelling to work. The City has already spent $40 million on purchasing land to preserve a four-kilometre corridor in which to lay the tracks. NSW Government Transport Minister Andrew Constance, on record in May 2017 as stating that the Green Square urban renewal project is a ‘public transport disaster’, said he would not rule out the prospect of a light rail line from there to Central. However, considering the present delays dogging the construction of the CBD and South East Light Rail from Circular Quay to Randwick and Kensington, in addition to new French trams incompatible with the existing light rail route from Central to Dulwich Hill, the likelihood of another tram service built and operating efficiently in time to soak up the tens of thousands of daily commuters set to surge into South Sydney does not have a snowball’s chance in hell of succeeding. Transport Minister Andrew Constance and the City of Sydney recommended short-term alternative measures could include cycling or walking to work – unlikely to prove popular among the elderly, less mobile, and pregnant women, especially in inclement weather – and improving existing bus services. Transport for NSW claims it has added extra trips to the 343 Kingsford to City and 370 Leichardt to Coogee via Newtown and Green Square bus routes this year, but residents in the affected areas complain that during peak periods, buses are frequently crowded before they reach them. Meanwhile a new 66km Metro rail service, Australia’s largest public transport infrastructure project, is now underway utilising five tunnel boring machines, the first of which will be in the ground before the end of 2018. The route courses between Rouse Hill in the north, via Chatswood through new underground stations in the CBD and inner south, thereafter replacing the existing T3 Sydenham to Bankstown rail route. It is eventually envisaged to reach Liverpool. The Metro will also service people in the Waterloo area via a new subterranean station. Nevertheless, some residents are skeptical that the Metro will relieve pressure on the neighbourhoods where the high-rise complexes are impacting lifestyles. Alexandria Residents Action Group raised concerns with the Department of Planning and Environment in May 2016 that they objected to it “on the grounds that the project should [also] provide Metro stations at Alexandria and St Peters, and does not. “This would provide provide mass-transit systems for the area’s doubled population, reduce chronic over-crowding on Erskineville station and reduce inner-city congestion. Unfortunately, the Metro is not forecast to be operational until 2024, which returns us to the existing transport nightmare. The City of Sydney suggests car-pooling. Perhaps the best short-term solution is an idea promoted by Wayne Moody, spokesperson for Rosebery Residents Action Group. “The Council should be putting on free buses,” he suggested. “Why wouldn’t we offer free transport, like in some cities that have a free bus loop going round and round? We have that in the City, but it only goes from Broadway to Circular Quay. “It could create employment for drivers and take a bit of pressure off the public buses like the 343 and the 310, and they could link it to Green Square and around Alexandria. “The new light rail to Randwick is going to be near capacity by the time it finishes. I can only imagine what it’s going to be like at the [Moore Park] football stadium when the games are on and everyone is finishing work at the same time.